Wanda is a widow. Her husband was killed and she is now alone. The family that once had her said she was depressed. I think that is so sad. I told the family that Wanda could come and live among our herd of chickens and I would do my best to get her a new family soon. Wanda is a Pekin duck. She will lay eggs, which is why I want ducks in the first place. Duck eggs are incredible for baking. Which is what I plan on using them for. The extra fat in the egg gives baked items more lift. And, if I ever get brave enough. Duck is supposed to be delicious. That my friends, is life on a farm... and truth be told, I am getting used to those ideas in this world we live in that is so unstable and in such turmoil. 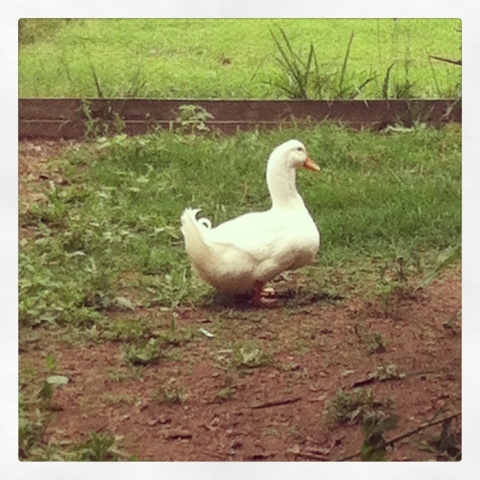 Wanda, I hope you are the first in a long line of duck fowl that live here on the homestead. I already enjoy watching you waddle and preen your feathers. You are a bit distant and undoubtedly lonely... I hope to help you remedy that soon too. Have a great weekend and hope you get some incredible bird goods.